So everyone keeps mentioning the fact that I don’t include enough photos in my posts, which I admit is true, but I am just not very good at remembering to get my phone out to take said photos. To make up for this failing I have worked out a better way of presenting the map of our ANZAC day adventure yesterday. Given a mild lack of time, and my strong desire to see the bay we rode out to Moreton Bay on ANZAC Day morning at a moderately respectable time. We had obviously missed the dawn service traffic but we did manage to get on the road before the majority of people departed for the service in the city or the their favourite BBQ spot. 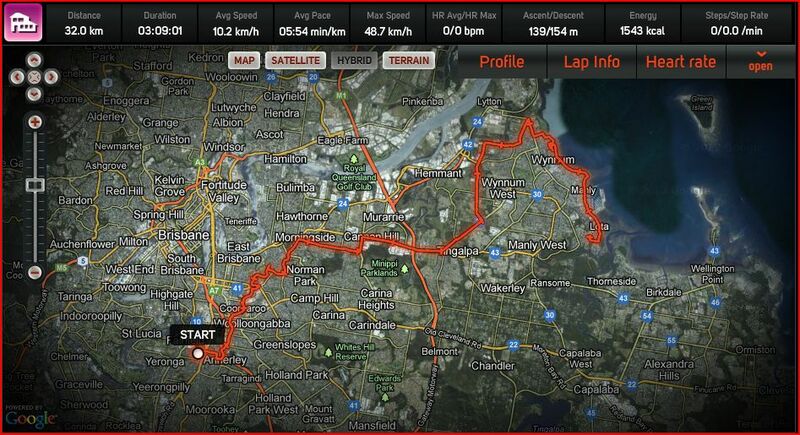 Our ride to the bay was another opportunity for me to see just how well Brisbane does cycleways. On the map below the only section that wasn’t on a dedicated cycleway, or a road with cycle routes marked was the very top right hand corner, and that was on quite back streets anyway. Following a successful trip (successful ride + successful coffee/brunch) we headed home on the train which was significantly quicker, before heading off to a BBQ of our own with a cheesecake strapped to the rack of my bike. But that is another story.